The British are fully aware of the perils facing the British and European economies, but refuse to let that entirely dominate the year ahead, according to our new report Hopes and Fears: The British Future State of the Nation Report 2012. According to the report, the public think the Jubilee will be better than the Olympics for Britain’s mood; Prince Philip and Sir Trevor McDonald top the poll for people who have been born outside Britain but contributed greatly to the country; and people in 2012 feel a strong connection to England, Scotland and Wales, as well as Britain. Most people don’t do too badly when asked to estimate roughly how many people in Britain were born abroad, according to the report. However, four out of ten people believe that more than 10% of the British population are refugees, a massive exaggeration of the real figure of less than 1%. In spite of this, 51% of the British public support the idea that government should encourage mixed schools to prevent segregation. Another promising sign is that Asians in Britain polled highest for patriotic pride, with 70% believing they belong strongly to Britain, a clear indication that integration can work. Norman Tebbit once linked integration to cricket by famously asking, “Which side do they cheer for? It’s an interesting test. Are you still harking back to where you came from or where you are?” British Future’s poll (below) sees the public hit Tebbit’s cricket test for six with 60% of people saying that immigrants should cheer for whoever they want to. 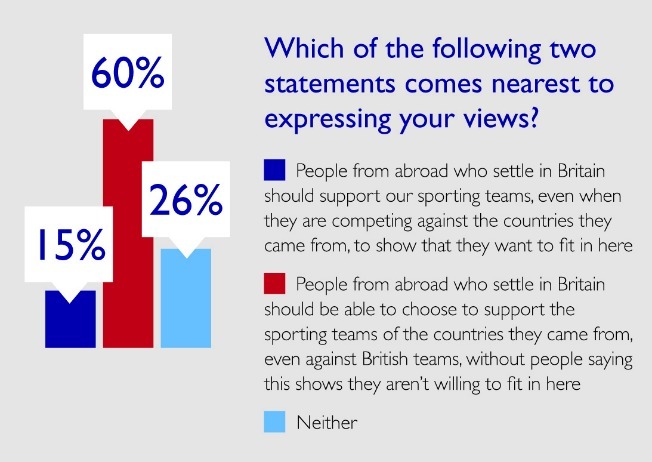 Most people (50%) also don’t want to insist that the children of immigrants cheer for British teams either. While the public believe modern Britain to be less racist, less homophobic, and less sexist than six decades ago, they also believe its parenting standards have deteriorated and that it is less polite. Strikingly, only a minority think Britain is more classless today than directly following World War II, with just as many saying Britain is just as class-bound as always. A strong sense of national identity does appear to make a difference to how positive or negative people feel. The report shows that 38% of the people that felt a strong sense of belonging to Britain feel optimistic about the year, while only 24% of those who did not have a strong sense of belonging have the same optimism. British people clearly want to see more opportunities for young people, with 68% of the public supporting a job or work programme for 18-24s. But despite high levels of youth employment, younger people are managing to hang on to a positive outlook with 37% of 16-24s and 47% of 25s-24s being optimistic. This positive outlook is mirrored throughout other age groups as well, as 52% of people in Britain are surprisingly upbeat about the impact of 2012 on themselves and their families. 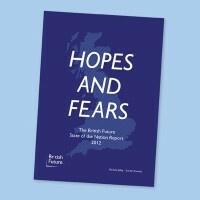 Read our report Hopes and Fears: The British Future State of the Nation Report 2012. Read the detailed figures from the State of the Nation poll. 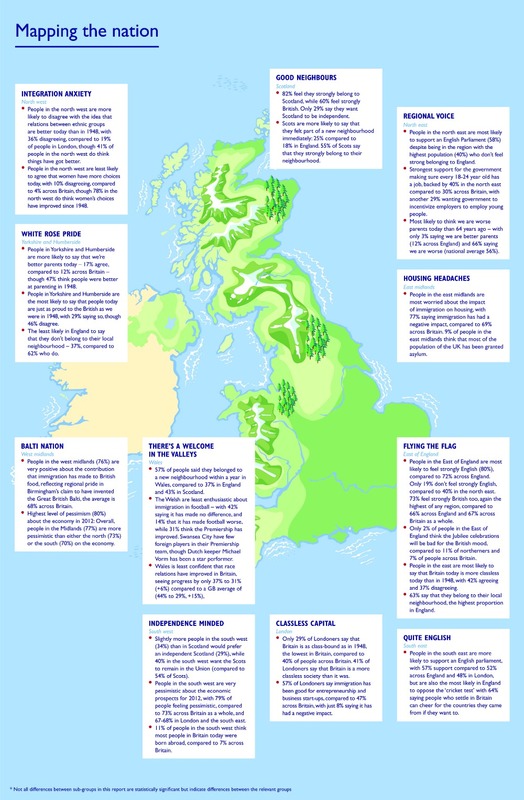 See our ‘Mapping the nation’ infographic here.